The medieval city of Beçin in southwestern Turkey's Muğla province that has hosted many civilizations is preparing to be included in UNESCO's World Heritage list. Prof. Kadir Pektaş, chief of the archeological excavation team, told Anadolu Agency that the ancient city near the modern town of Milas dates back to 2000 B.C. but it earned the importance during the Menteşeoğulları beylik (principality) in the 13th and 14th century. 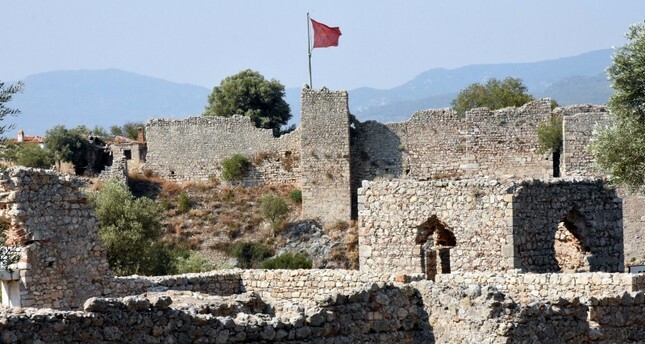 "Beçin Castle is a place that gives very significant traces of Anatolian Turkish art," he said. "The Beçin Ancient City is not only famous for its historical structures but also its diversity of plants and animals. For this reason, we are conducting studies for the UNESCO permanent list," he added. UNESCO also described the Menteşeoğulları as one of the "most important" beylik in terms of the cultural elements that they left in the western Anatolia which could be accepted as the first examples representing the characteristics of the Ottoman Empire. "The architectural remains of the Beçin city not only enlighten the Western Anatolian architecture of that period but also the form of the first Turkish settlements in that region," UNESCO said in its description statement. The archaeological site of Beçin has been excavated systemically since 1972 and in 2000, a hoard of coins, 60,000 of which are from Ottoman period, was found in Beçin, it said. "It is not only the largest hoard that has ever been found in Turkey in archaeological excavations, but also the largest cache of Ottoman coins that has ever been found," the UNESCO added.